Being born in Japan, living in Italy and traveling the world with my family placed me on my path as an artist. At age 12 I learned oil painting and the love of art paper from my grandfather. During high school in Germany I studied printmaking at Kunstshule RÃ¶del, Mannheim. This was followed by 2 years in the BFA program at Daemen College, Amherst, NY. I first began selling my paintings in 1968. While in Washington, DC I studied oil painting, and served as teaching assistant, at the Corcoran School of Art. 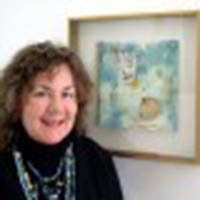 During my 30 years living in Boulder, CO, I created and exhibited paintings, drawings and crafts. While employed at Naropa University I took art classes and taught through the Extended Studies Program. My love and respect for nature was deepened while studying with Native American Elders especially Wallace Black Elk. In 1999 I designed the home and studio my husband built on Sunwise Farm and Sanctuary in Kentucky. A desire to create more loosely led me to combine my drawings, water media and botanicals in a collage format. Since being in Kentucky I have created 1,500 works, consulted and exhibited nationally. My lifestyle now is like a collage. I integrate art making, beekeeping and gardening. I continue to develop our land as a destination for classes and art salons. Nature is an enduring source of inspiration, and its essence is palpable in all my work. I am interested in what lies beneath the surface appearance of things. Observing a sunflower I ask; what is the sacred geometry of its design, what does it convey, what mystery gives it life? What I see and then bring into form are creations that reveal the subtle dimensions of reality. I translate natureâ€™s qualities of beauty, transparency, layering, mutability, communication and life force into art. I express the complexity and fragility of the world. I revere the simplicity and strength of life and nature. I paint about energy, consciousness, light and shadow. I am informed by the cycles of nature, cosmos and humankind and how they interrelate for mutual benefit. I explore the interplay of perspective and flatness, time/space, order and chaos. In the moment the creative flow connects me with my right place where I seek to touch the soul at the deepest level.